Leather is a very strong durable fabric that we have used for many years in rough and tough jobs. My first thought goes to the rustic cowboy. I chatter and sway my thoughts to the iconic Cat women…MEOW….leather head to toe. Then I think of all the the outlaw motorcycle bikers that ride off into the sunset wearing leather to ward off road rash. Finally my mind cannot forget the rock/punk icons that wore leather in the rawest meanest way. This FRTW 2013 collections seem to have tossed and mixed all these genres and then some into the fashion world in all the right ways this season. 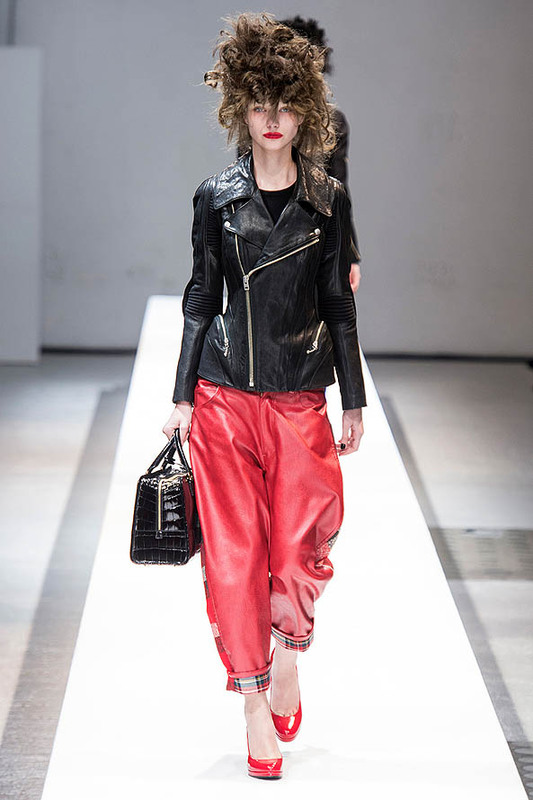 Designers that showed off sultry leather this season included Mulberry, Oscar de la Renta, Barbara Bui, Haider Ackermann, Jean Paul Gaultier, Junya Watanabe, Prada, Kenzo, Band of Outsiders, Jil Sanders, and Donna Karen. Mulberry had lovely deep Nappa colored leather that was rich with desire. Huge oversized pleated skirts, Coats with voluminous sleeves, Trousers worn over skirts, Floral tunics, Capes, Oxfords and Tweed coats all had a fantasy meets British country side romance appeal. 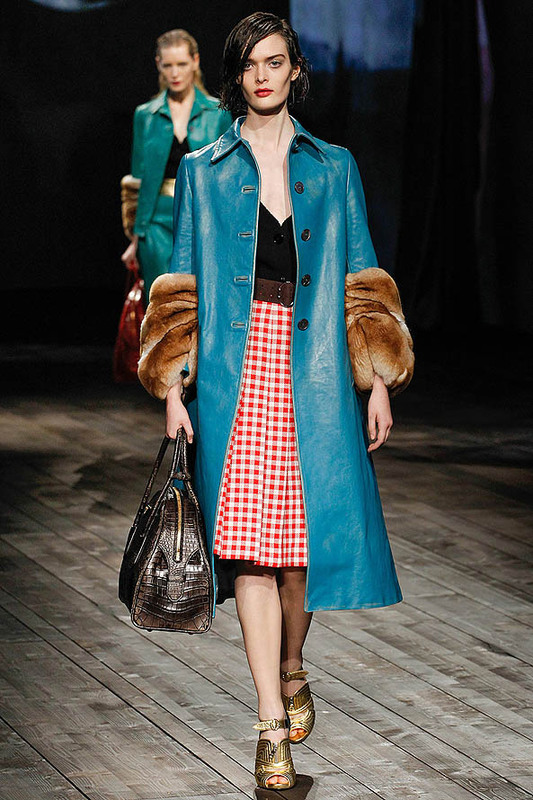 Prada designer channeled the 40’s & 50’s voom voom bomb shell Hollywood look and brought plenty of sauce to the table. The undone wet hair and mysterious look of a heroin that needs no fashion rescuer; no matter the storm she has encountered. Knee length pleated and printed skirts, belted cinched in waists, glitzy heels and sandals, oversized bowler bags, full skirted coat dresses fur coats, leather skirts, and colored leather coats trimmed with fur cuffs made me dream of days of film noir. Models walked the runway with messy piled up hair and it was fresh, fun and striking. Junya Watanabe mixed fabric and textures pulling from the world of punk rock like a master puppeteer. I couldn’t take my eyes away from the brilliance and madness of all the fabric reused and combined together. Motorcycle jackets, cropped leather pants, patchwork pants, plaid and leather dresses, leather and shear dresses all shouting rebel echoed to the top of the fashion gurus headquarters. I traditionally go for the motorcycle bad girl look when wearing leather. Above is a Burberry coat I would love to own one day. With the ever moving trend of leather traveling in so many directions such as classic, romantic and colored leather it is time to try many other ways to wear leather. Every girl should have a great leather jacket! It is a staple piece. If your not one for real leather there are many pleather options to achieve the look you desire. With leather mania underway every fashionable girl and boy must try this trend.